On Feb. 28, 1989, the day the veterans committee was to announce its selections to the National Baseball Hall of Fame, coach Red Schoendienst was at Cardinals spring training camp in St. Petersburg, Fla., with his wife, Mary. “When is the announcement?” Mary asked. “I’m not going shopping,” Mary said. Schoendienst, the longtime Cardinals second baseman, got the call from Ed Stack, Hall of Fame president, informing him he’d been elected to the Cooperstown shrine, ending a wait of 20 years. 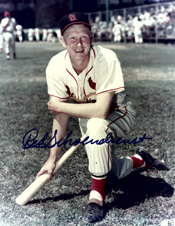 Schoendienst and umpire Al Barlick each got the necessary 14 votes from an 18-member veterans committee which included Red’s friend and former teammate, Stan Musial. Joining them in the 1989 Hall of Fame induction class were Johnny Bench and Carl Yastrzemski, each of whom was elected by the Baseball Writers Association of America. Harry Caray, the former Cardinals broadcaster, also was headed to Cooperstown as 1989 winner of the Ford C. Frick Award for broadcast excellence. “A great player and a winner,” Caray said of Schoendienst to Rick Hummel of the St. Louis Post-Dispatch. Schoendienst had been on the Baseball Writers Association of America ballot for 15 years (1969-83) but failed to receive the necessary 75 percent of the votes for election. His best showing was 42.6 percent in 1980. Schoendienst played 15 seasons for the Cardinals. He managed them for 14 years, achieving 1,041 wins, two National League pennants and a World Series championship.